Welcome to The VAR Guy's CompTIA Breakaway InfoCenter. Here, you'll find news, analysis and perspectives from the popular channel partner conference. For the fourth consecutive year, The VAR Guy will power the Channel Chief panel at Breakaway, plus he'll be blogging live throughout the event. Welcome to The VAR Guy’s CompTIA Breakaway InfoCenter. Here, you’ll find news, analysis and perspectives from the popular channel partner conference. For the fourth consecutive year, The VAR Guy will power the Channel Chief panel at Breakaway, plus he’ll be blogging live throughout the event. Check this page regularly and throughout the year for live news, previews and recaps of the event. Juniper Partner Advantage, Partner Summit: Channel Chief Frank Vitagliano describes recent channel partner program milestones, and confirms plans for a 2013 partner summit. 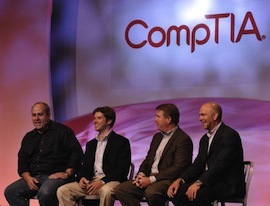 CompTIA Breakaway Day 2: Twelve Rumors in the Hall: The chatter involves multiple channel chiefs representing VMware, Verizon, Cisco Systems and Panasonic, plus rumors from booth visits. CompTIA Breakaway – Rumors in the Hall: In addition to Big Data and Machine to Machine conversations, chatter in the hall involves a range of BDR (backup and disaster recovery) conversation in the cloud. Power Up Your Cloud Practice: Without a strong client relationship, VARs and MSPs may find themselves left out of key cloud technology business decisions. Red Hat Certifies 400 Virtualization Professionals: Channel Chief Roger Egan (pictured) provided the details at the 2011 conference. CompTIA Invests $4M in Technology Education: CompTIA — among the best-known associations serving VARs and MSPs — has undergone some dramatic changes under CEO Todd Thibodeaux. You might even say that we’re all looking at CompTIA 3.0. Here’s why. Channel Training: Covering cloud computing, managed print services, mobility, vertical markets and more.